Ever think of how much money those little candy vending machines at the car wash make? …the ones with the gumballs or Mike & Ikes in them. Like a lot of people, you probably either thought they are making peanuts or killing themselves filling up vending machines all over the city every day. You would be wrong! They make amazing margins and the service is nothing. * cracks jokes about how he could take “6 weeks vacation” (!!) if he wanted and his candy business wouldn’t miss a beat. When I read his article on GeniusTypes, I had to agree with every word. We hear from our customers all the time about how much freedom and independence (and money!) they’ve gained from starting their own bulk candy business. All it takes is a good plan (which Brain has provided for you, thanks B! ), and a little motivation to get started. He’s got that part covered too. Can’t argue with that logic, Brian. So, get going and earn yourself some extra money, some more free time, and a little extra love from everyone you meet when you tell them you’re the candy man! …or sugar momma, for you ladies! 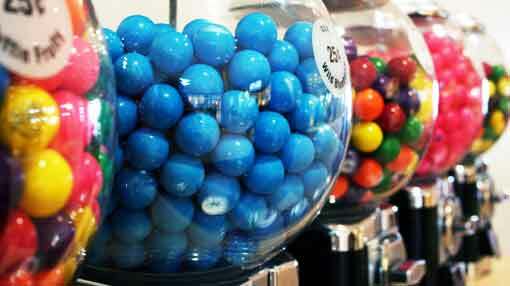 What concerns would you have about starting a bulk candy vending business?